You are here: Home / FAQ's, Acronym’s, & Terminology / FAQ: Do I really need to test smoke detector monthly? Yes, for a few reasons. The primary reason for a stand-alone system is to make sure the battery is still alive & the unit is working properly. For interconnected units which will set every unit off, this is to ensure that a mouse or other critter hasn’t done any damage. Most have a simple “test” button on them as shown below. How about the smoke test? It is true if you press the test button, that doesn’t mean it is fully operational as the sensor could be blocked. That is why some recommend doing a smoke test with a special tester. Well if you may recall from our Primer article on Options available, there are two main types & many “testers only work well on certain models. That doesn’t include they type that only recognize raising heat levels only. With todays technology & proper maintenance, this is generally a test that can be skipped. With that said, every 6 months you should vacuum the unit off, whether you need to replace the batteries or not. In fact when you reach up there to test the system, it would be worth seeing if it appears dusty & do it then. (You may also want to solve the air leakage issue that is getting it so dusty) For more on required maintenance, you might want to check out our monthly maintenance articles or this piece on Fire Detector Maintenance. 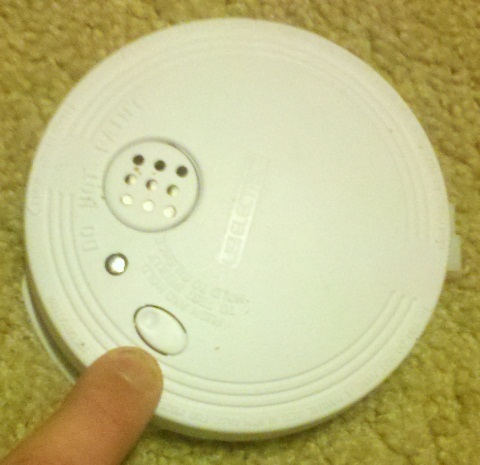 This is part 2 of our 3 part Daylight Savings Time & Smoke Detector pieces.